Fair Trade USA (FTUSA) recently finalized a “fair trade” apparel program, and Patagonia soon after announced the launch of a “fair trade” yoga line implementing it. This should all be good news to an organization like ours that advocates for fair trade in the marketplace, but unfortunately it is not. To provide context for why this program is unacceptable, it is important to know that cotton farmers in the Global South are some of the most marginalized farmers in the world. Impoverished cotton farmers in Mali, Benin, Burkino Faso and Chad have been recognized internationally as victims of trade injustice. According to the Environmental Working Group, U.S. cotton subsidies, which totaled $32.9 billion from 1995–2012, artificially enable American cotton farmers to undercut prices from the Global South. This is just one example of global policies working against small-scale farmers in more marginalized regions. Small-scale cotton farmers in the Global South, organized into cooperatives, exemplify the central tenants of the fair trade movement, including empowering marginalized producers to compete in a global market, to obtain fair prices and to build sustainable communities. Unfortunately, Patagonia’s “fair trade” yoga line, slated for release in the fall of 2014, will not contain any fair trade cotton from certified fair trade farmers, though the cotton will be organic. Patagonia has chosen the option to certify only the very last stage of production, the cut-and-sew factory. This option, set forth by FTUSA and adopted by Patagonia, completely disregards all preceding stages of apparel production (spinning, ginning, etc.). Farmers, the very core of fair trade, are excluded from fair trade benefits, as are workers at other stages of production. But what is most troubling is that FTUSA developed this option of factory certification, even though they are not labor experts, nor did they include labor experts in the final development stages. In fact, after FTUSA completed its initial exploratory outreach, a group of labor organizations wrote a letter critiquing the program and asking that it not go forward. There is no doubt that apparel factories globally need to improve. The Rana Plaza disaster in April of 2013, in which over 1,100 workers in Bangladesh were killed in a factory building collapse, highlighted the dangerous working conditions that most apparel factory workers face today. Workers in this industry also face notoriously low wages, exacerbated by widespread practices such as wage theft. There are many organizations, whose expertise lies in the realm of labor justice and workers’ rights, addressing these problems. FTUSA’s own feasibility study notes that many existing factory audit programs already guarantee basic labor standards, but what is missing — and what is in fact the most important next step — is forming and supporting democratic worker organizations in the form of worker-owned cooperatives, labor unions and other worker associations. Yet the final published standards make only two references to democratic organization, both in reference to the fair trade committee, a committee tasked primarily with distributing a financial fair trade premium that participating companies pay. A fair trade committee is not a substitute for democratically organized and empowered workers, and a cash premium is not a substitute for paying workers a living wage. To the second point, FTUSA’s own apparel pilot report notes that these premiums add up to just $35 annually per worker on average. It was naiveté at best, or perhaps arrogance, that led FTUSA to believe that they could sweep in with no factory experience and create “fair trade” factories. And it is not surprising that their factory program fails to empower or even benefit workers. Fairtrade International, the largest global fair trade labeling network, has concluded that apparel made with fair trade cotton should not carry a full fair trade seal, as that would be disingenuous given the current state of factory production. In contrast, FTUSA has decided that it is okay for apparel to carry a fair trade label when only their own inadequate factory standards are upheld — and only at one factory of many in a single supply chain. Though they justify this decision because the word “factory” accompanies the seal on such apparel, the facts remain: cotton fibers contained in a piece of apparel carrying FTUSA’s seal may come from farmers in Africa who cannot afford to feed their families, or from farmers in the U.S. who are growing genetically modified cotton and benefiting from U.S. cotton subsidies; workers at other factories in the supply chain may in fact be exploited; and workers at the certified factory are not truly empowered. There is a very real risk that the label will mislead consumers into believing that they are making an ethical purchase that supports producers, even when most of the people involved in the production remain impoverished, un-empowered and outside of the fair trade system. Once a company gains the fair trade label, they then have little incentive to improve conditions across the rest of their supply chain. Therefore, rather than being a step in the right direction, this type of program misleads consumers, while stunting real progress — and in that way, it is worse than having no fair trade apparel at all. If there is hope to be found in the apparel sector, it is in the increasing awareness of consumers who will demand better policies from governments and brands, in pioneering companies who consider their entire supply chain for all products offered, and in the progress made by labor rights leaders. 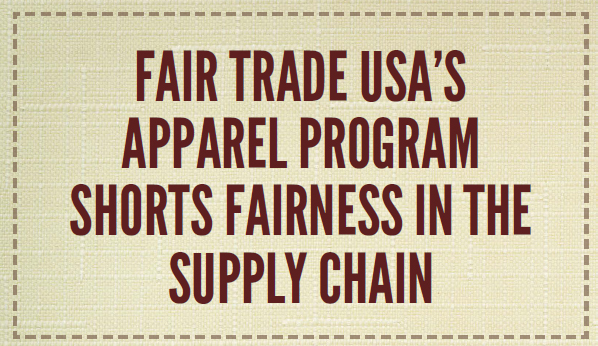 Indeed, it is not to be found in FTUSA’s current “fair trade” apparel program.